What a wonderful weekend we have had. For the first time since The Wee Page Turner was born we had a weekend with no visitors. Not that we don't like having visitors, we do, but it was so lovely to spend some time together just the four of us that didn't revolve around bedtime routines (during the week the only time we are all together is when Daddy gets home from work at 6.45pm). We had a lovely birthday party, the local Summer Fayre (which BookBairn thoroughly enjoyed) and a trip to the Scottish Deer Centre to have a Father's Day breakfast and enjoy seeing the animals. It helped that the sun was shining the whole weekend! Do you have memories of picture books read to you when you were younger? Do you remember any books that you read yourself when you were at primary school? I have vivid memories of reading The Very Hungry Caterpillar when I was in nursery. I recall the reading area with little seats and the well read copy of Eric Carle’s book. It was a paperback copy and felt flimsy in my little hands. I was fascinated by the holes in the book representing the caterpillar’s bites. I fell in love with the illustrations and especially loved the food drawings. Those amongst a whole host of memories I hope my little ladies (a 2 year old and a 6 month old) will remember, having snuggly reading time and enjoying the books read to them. My two girls really do enjoy books. I am always looking to see what books I can get them and adore the reading community on Instagram (where I met Kim) and the super duper book bloggers where I get lots of great suggestions. I try to also cater to my daughters interests. I also use books as an opportunity to teach my daughters all sorts of things. Books have been a great tool in developing my toddler’s language, they say an apple a day but a book (two, three, four..) a day can also do amazing things. As Studies have also shown that children who were read to as newborns have a larger vocabulary, as well as more advanced mathematical skills, than other kids their age. There's also a direct link between how many words a baby hears each day and her language skills. One study found that babies whose parents spoke to them a lot scored higher on standard tests when they reached age 3 than children whose parents weren't as verbal.CCCCimportant as it is to read to your child, it is also lovely to ask questions and engage in conversations about what has been read as well as what can be seen in the pictures. There are some books that proved very popular with my toddler when she was a lot younger. It is also lovely to see that her baby sister is also enjoying these books now. Baby’s Day by Little Tiger Press. With its rhyming text and beautiful photos of real babies, this is a very fun read. The book shares a baby’s day from waking, “Wake up Baby…” and ends with bedtime “Night Night ..” Little One still enjoys reading this, recalling the text from each page by memory. Baby squeals at this book and she loves to touch the photos of the different babies in the story. 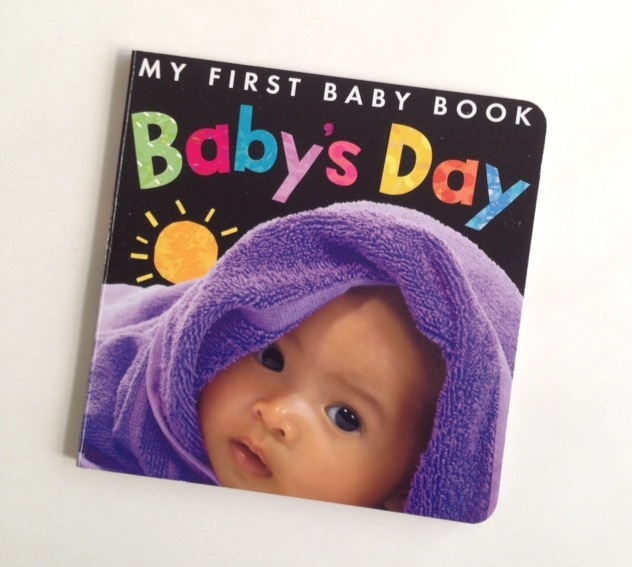 It is a book inclusive of babies from around the world. Brilliant. We received this book from our health visitor at baby’s 3 month old check-up. The book came in a pack made by the Bookstart Bookstart began in 1992 and is the world’s first national bookgifting programme. It is ran by the reading charity BookTrust. You may have also received a pack. This is a charity that gifts book packs to little ones under one years old, in England and Wales. They intend to “Inspire a love of reading” and also give another pack to children just before they start school. I believe Scotland’s equivalent charity is Bookbug. Bookstart also have a Bear Club. 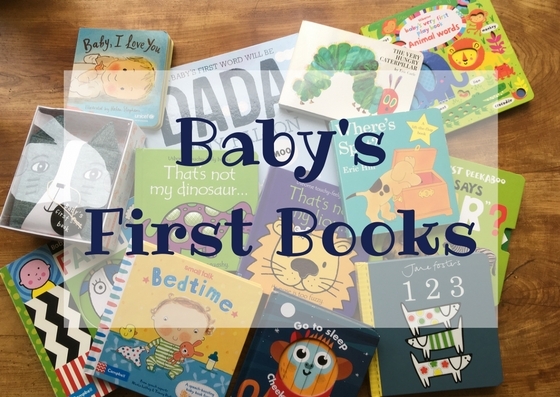 Their websites, Booktrust.org.uk and http://www.bookstart.org.uk are filled with great information, games and suggestions of good reads for your children. They encourage you to become a member of your local library and to encourage children to borrow books they have Bookstart Bear Club. My eldest daughter loves this! She receives a stamp in her special Bookstart book each time she visits the library and this then leads to certificates. A great incentive. Do ask your health visitor if you have not received one. Packs can vary but my youngest daughters looked like this. Being read to is such a gorgeous share and too often underestimated. It opens up a different world to little ones and with the use of an expressive voice, what is not to love. Just like reading, singing is another lovely way of having fun with your babies and toddlers. Babies will appreciate the varied intonation and expressive faces used and toddlers will enjoy completing actions to the songs and bouncing around lots, at least my toddler does. : ) One book that has proved very popular and one that I bought even before I met my babies is Baby’s First Rhymes. There are just so many lovely books out there. Sometimes by Emma Dodds is a book I bought when Little One was a few weeks old and it is just gorgeous. 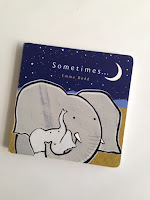 Emma Dodds is very talented and her books are super. “Sometimes you are good, sometimes you are bad. Sometimes you are happy, Sometimes you are sad.” Dodd’s identifies the many emotions and behaviours of children but no matter what we, their parents, carers, grandparents, grown-ups, love them dearly and unconditionally. It is so important for children to know this and to be reminded of this daily. Perhaps some of the adjectives used in this book could have been better chosen however, I believe that the words can be explored further with your little ones. My eldest daughter and I had a discussion about what her favourite picture book is. 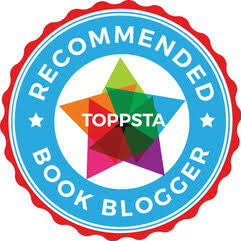 We discussed which book would also be a nice book to read to children who have recently become older siblings. She chose I Love You as big as the world by David Van Buren. When I then mentioned to Little One that I would be writing about the book in this post she described it as the “I Love you Book.” How cute! 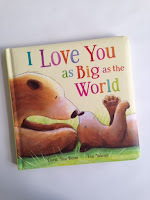 The book is just a delight, following two adorable bears on a very busy day, sharing their immense love for each other. The illustrations are completed beautifully by Tim Warnes and done in a style that I really do like. The bears share playful, loving, relaxing moments and often hand in hand. 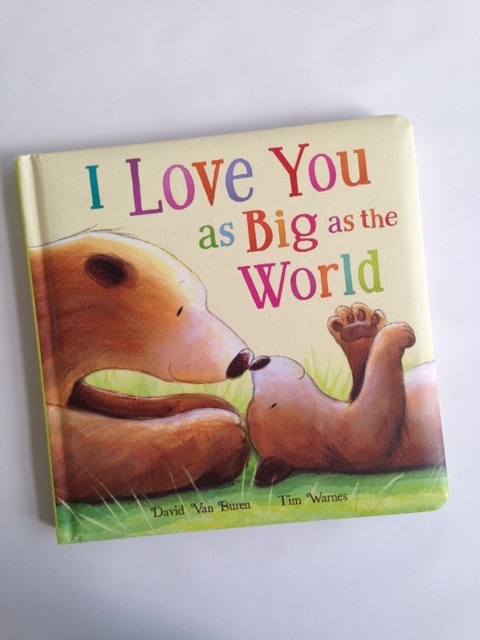 The repetition of “I Love you…” on each page makes the text memorable for little ones and a joy to read. It is hopefully three words that the child reading this book hears on a daily basis. A gorgeous book with a lovely message all about love. Have I tempted you to have a search for these books? I do hope so. Finally, Kim, thank you for letting me share my thoughts on reading and favourites. Baby Harvey or shall I say Wee Page Turner, welcome to the world. We are sure BookBairn will have many fantastic reads ready for you to enjoy and we look forward to finding out which books your interests will lead you to. What great recommendations Filza! Thank you! As you may have noticed in our previous blog post, The Wee Page Turner is already a fan of 'Sometimes' by Emma Dodd (though I actually prefer her book, 'Me'). And in Scotland we are lucky enough to have the Bookbug scheme which Katherine mentioned in our previous Baby's Love Books feature which is a similar scheme. I will need to look up 'I Love You as Big as the World' because it just sounds to irresistible. Hope you enjoyed this most recent guest post, to find them all click here. You can fins Filza's blog 'Mamma Filz' here and I highly recommend that you follow her beautiful bookish photographs over on Instagram. We have Sometimes already but not the others. I believe library requests need to go in! Sounds like some great recommendations. Also sounds like a great weekend. Sorry I couldn't be there to ruin it (only joking). We had a great time! And I think you would have enjoyed the Deer Centre!